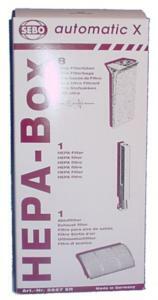 SEBO X Series HEPA Service Box includes 8 bags, 1 HEPA Filter, and 1 Exhaust Filter. Fits X1, X4, and X5 series vacuums. I do alot of online shopping. All Brands is one of the best companies I do business with. Follow up after order was very impressive. Very glad to have found your site. I do alot of online shopping, and your site is one of the best.